THE LIVERPOOL SANTA DASH CELEBRATES ITS 10th ANNIVERSARY THIS YEAR and it remains the biggest and the best Festive fun run anywhere in the world. 2014 will see the biggest Santa Dash the city has hosted, as the U.Ks biggest Festive Fun continues to grow year on year. This year an expected 10,000 will be taking part as runners, walkers and hop, skip and jumpers make their way around a 5K course in Liverpool city centre. The Santa Dash is Liverpool’s most popular running event with people coming into the city from far and wide – just to take part in this amazing event. Many just enjoy the atmosphere, but the vast majority taking part use the event to fundraise for a wide range of worthy causes. The Liverpool Santa Dash -Sunday, 7th December 2014, 9.30am start. 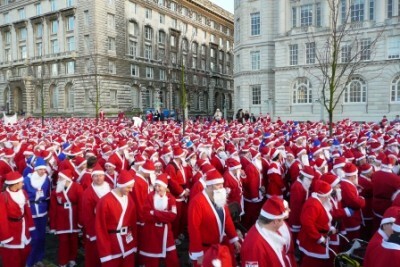 If you would like to take part then you can enter via the online facility visit the website http://www.btrliverpool.com/#!santa-dash/c1hsh or or you can call in to the event office at 23 Hatton Garden in Liverpool city centre.